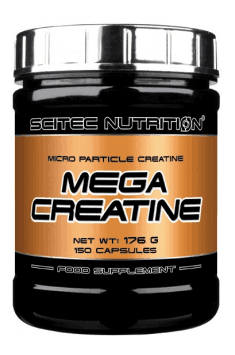 Scitec Mega Creatine is a dietary supplement which gives you complete training support. Each capsule contains 1000 mg of creatine monohydrate in an advanced, micronised form. Training efficiency is associated mainly with effective function of myocytes – muscle cells in which large amounts of energy are produced that is required for intense physical activity. One of the compounds found in muscles is creatine, which is phosphorylated in the body to phosphocreatine. The main role of this substance is to store energy. Creatine is a substance formed in physiological conditions from amino acids – arginine, methionine and glycine. It is provided also with food as a basic component of meat. Nowadays, it is considered one of the best anabolic agents available for athletes. Levels of stored creatine vary. By increasing its intake, we change its levels in muscles. Increased creatine concentrations contribute to enhancing the body’s performance during short strength exercises. This is due to, among others, an increase in energy release during the breakdown of ATP which is used for the mechanical function of muscles. According to scientific studies, creatine affects cardiovascular function by increasing stroke volume. This helps improve the utilisation of oxygen for cellular respiration. Creatine monohydrate affects also the hydration of muscle cells. An increase in muscle creatine levels promotes water retention. It is suspected that this effect is the main factor causing enhanced muscle protein synthesis. Higher protein levels help increase muscle mass and improve muscle structure. It is worth emphasising that creatine supplementation helps speed up the regeneration of muscle fibres by neutralising lactic acid formed during exercise. This helps restore a normal pH in tissues and thus optimal function of muscle cells. The micronised form of creatine in this supplement improves significantly the gastrointestinal absorption profile of the substance. Smaller particles are more potent and may thus penetrate into the body faster and more effectively. To sum up, Scitec Mega Creatine is a formulation which influences positively the body’s performance during physical exercises. It stimulates the growth of muscle tissue and boosts the production of energy required for muscle contractions. Regular use may help improve your training effectiveness. The best results of supplementation can be achieved in combination with an adequate diet. Take 5 capsules per day before meal, after training. Take 1 portion in the morning on an empty stomach or in the afternoon between meals. Creatine supplements are generally well-tolerated. However, they may cause intially gastrointestinal discomfort. When it persists for a long time, it is recommended to change the form of the supplement. Creatine boosts quickly energy levels during a short, vigorous workout. Because of that, you can achieve the best results of supplementation when you combine it with such training as sprints and weightlifting. Bovine Gelatin, Anti-Caking Agent (Magnesium Stearate), Color (Titanium Dioxide).